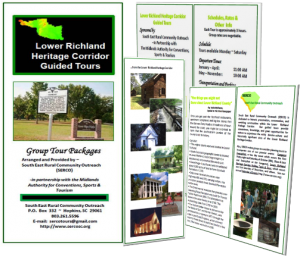 Lower Richland Heritage Corridor Guided Tours. Group Tour Packages Arranged and Provided by South East Rural Community Outreach (SERCO). Supported by the Midlands Authority for Conventions, Sports & Tourism. South East Rural Community Outreach (SERCO) is dedicated to historic preservation, conservation, and enriching communities within the Lower Richland Heritage Corridor. 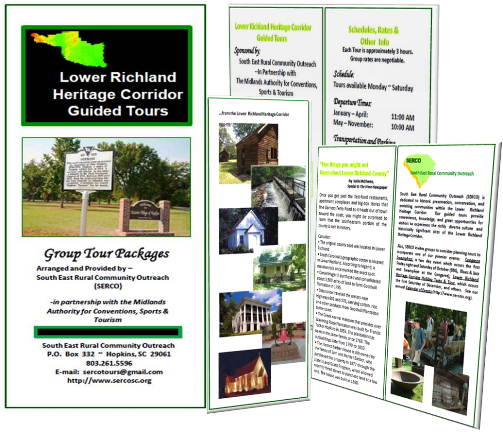 Our guided tours provide convenience, knowledge, and great opportunities for visitors to experience the richly diverse culture and historically significant sites of the Lower Richland Heritage Corridor. The majority of SERCO volunteers were born/raised/reside in the Lower Richland Heritage Corridor. They know the back roads and the related “back stories” of the people and the area. Once you get past the fast-food restaurants, apartment complexes and big-box stores that line Garners Ferry Road as it heads out of town toward the coast, you might be surprised to learn that the southeastern portion of the county is rich in history. South Carolina’s geographic center is located in Lower Richland. According to legend, a massive rock once marked the exact spot. Daniel Huger II purchased and consolidated about 3,500 acres of land to form Goodwill Plantation in 1795. Ships once traveled the waters near Highways 601 and 378, carrying cotton, rice and other products from Goodwill Plantation to the coast. The Greek revival mansion that presides over Wavering Place Plantation was built for Francis Tucker Hopkins in 1855. The plantation has been in the same family since 1768. The outbuildings date from 1790 to 1810. The Harriet Barber House is still owned by the family of Sam and Harriet Barber, who purchased the property in 1872 through the state’s Land Grant Program, which allowed recently freed slaves to purchase land at a low rate. The house was built in 1880. Each Tour is approximately 3 hours. Transportation to Lower Richland sites arranged by request. Parking for tours will be available at City parking facilities near the Columbia Regional Visitors Center. Exact parking locations will be announced on a per-tour basis. Step-on Tour Guide available upon request.